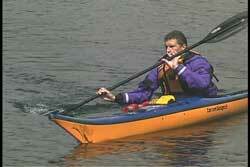 There are many different ways to turn your kayak when it is moving. If you do not want to lose momentum you can introduce a forward sweep stroke into your normal forward stroke sequence to give you more turning power. If you need to slow down and maneuver at the same time, you can choose to do a breaking turn such as the stern high brace turn or the low brace turn. See USK article, "Low Brace Moving Turn." I like to use the stern high brace turn when my kayak is moving quickly and I need to quickly maneuver between kayaks during clinics or in rock gardens when I am playing. I also use the stern high brace turn when I surf waves. As you will see at the end of the article, the stern high brace turn lends itself nicely to moving directly into a forward stroke if it is needed. Of course, having a strong forward stoke will provide you with plenty of momentum. Since this technique can also be used in surf, your momentum may be generated by the wave you are riding. In either case, since this is a breaking turn we are assuming you are moving with some speed. If you were moving slowly you will probably not going to use this skill as an option. The second reason to rotate your body is it allows you to begin edging your kayak when your outside knee/thigh hooks under the thigh brace when you rotate your torso. 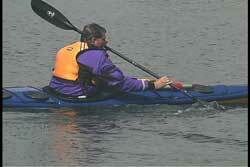 When you hook your knee/thigh under the thigh brace and rotate, your kayak automatically begins to edge. See future USK article, "Leaning vs Edging." 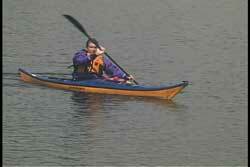 The reason you want to edge your kayak is the greater turning ability you get from a kayak when it is on edge. The third reason you want to rotate is to get look at your blade before you place it on the water. Since this is going to be a high bracing turn, you want to be sure that your blade is in the high brace position with the power face facing the water and your arms are in a secure high brace position to minimize any potential shoulder injuries. See USK articles, "Shoulder Safety" and "High Brace And Low Brace Blade Mechanics." Once I see I have my blade ready for a high brace, I know I can feel comfortable to begin to lean out over the water without concern of capsizing, because the high brace will provide the support to keep me upright. How much you lean and how much support you will get from your paddle moving over the water, can only be learned from experience. Sooner or later you will lean too much for the support you are getting and you will probably capsize. Please do not get discouraged, because this is part of the learning curve. Since this is a decelerating turn, I will be slowing down as my paddle drags in the water. This is part of the reason you chose this technique. You decided you need to slow down and turn at the same time. I often use this technique to get to a capsized student's bow. I plan my approach so my kayak stops at the bow and have my kayak turned into position for a T-Recovery. See USK article, "T-Recovery." I can adjust my deceleration by how much I lean on my paddle. The more I lean the more drag and the more quickly I stop. 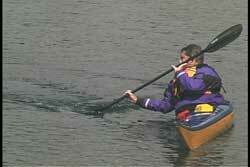 Keep in mind that the slower you kayak moves the less support you get from your paddle. Therefore, as you slow down your brace is becoming less supportive. You now have some choices to make. You can start moving more of you body weight back over your kayak (less leaning) or you can begin moving your paddle by rotating your body forward to provide more support from the blade. As you rotate your body forward, while staying in the high brace position, your blade will be moving over the water as if you were performing a part of a sculling brace. See USK article, "Sculling." Since you can only move your paddle so far, sooner or later you need to get your body weight back over your kayak because your support will disappear. 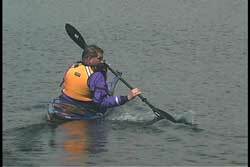 I like to use a combination of moving my paddle and bringing myself back over the kayak. 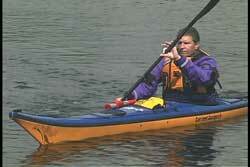 In fact, I use my moving of the paddle (that half forward scull) as my way of bringing my body back over my boat. 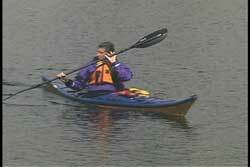 I know I have to move my paddle as I feel my blade beginning to sink as the kayak slows. From experience, I know where my capsize point is and when I feel I am approaching that point a little voice in my head begins to say, "Danger Will Robinson, Danger." I also call it an "Uh Oh" moment. 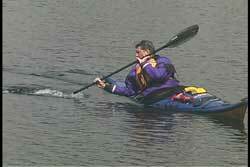 See USK article, "Uh Oh Moments In Kayaking." When this occurs I know I need to begin sweeping my stern high brace toward the bow and bring my body back over my cockpit. Once I complete the stern high brace turn, I am in a very proactive stable position, to paddle forward or change my paddle and body position as needed for my next maneuver. When I have used this technique in surf, it was usually done when I wanted to ride a wave and then get off of it to go out and ride another one. See USK article, "Surf A Wave And Get Off."